Using feng shui rules and principles to design a koi fish pond ensures your efforts reap beneficial chi, especially wealth luck. These ancient tools will help you find the best location for your pond without compromising other areas in your life. There are specific rules you'll want to follow when analyzing your property for the best pond location. Water features, especially a body of water, can't be located in just any sector with countering governing elements, such as the South (fire element) where water is destructive. A feng shui practitioner can do an analysis of the home's kua number to help you decide on the best sector for locating your pond. What Do Koi Fish Symbolize? Another alternative is to select a location that can generally host a water feature, such as the east, southeast, and north sectors. The water element will feed the east and southeast wood element. The north sector is governed by the water element and is typically a good candidate for a water feature. Other sectors can host a pond, but would require a feng shui expert. An analysis of your home's kua number (year built), location of the flying water star 8 (wealth star), and facing direction would need to be calculated. You will need to decide what size and shape you want for your pond. The size of your garden or yard will determine just how large or small your pond will need to be. Size the pond to scale with your home. In other words, you don't want a pond that's too large for the property and disproportionate to the house. 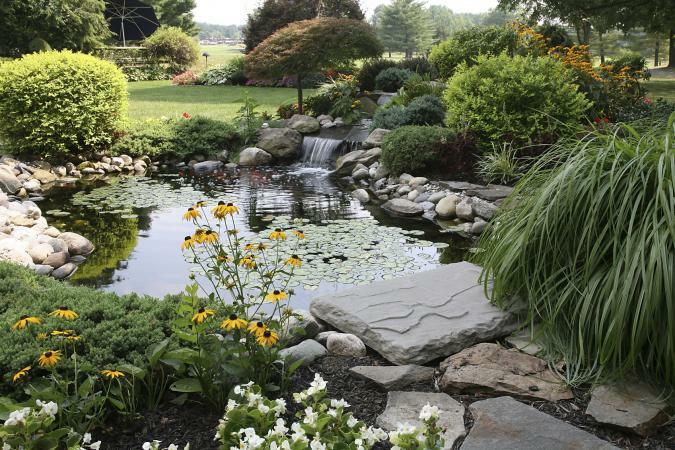 The pond should be appear to be a natural part of your overall yard/garden with a natural pattern and flow. The ideal shape is round since it's the shape associated with water. That doesn't mean you're limited to just a round pond. If you decide to make it irregular in shape, keep it symmetrical with curves instead of straight lines. The depth and flow of the pond water will directly affect your wealth and income. If you live where winters are cold or harsh, check with your local aquatic supplier for pond depths needed for the fish to shelter against temperature drops. Wealth luck (asset wealth) is defined by the accumulation of water, such as a koi pond. The pond shouldn't be shallow so your wealth isn't. The water in your pond should always be clean. Dirty stagnant water will make your wealth stagnate, also. It's best to keep the pond filled with fresh flowing water. You can use a fountain in the center of your pond and adjust it from bubbling to giving a cascade spray. Build a waterfall - You may prefer to build a waterfall to recirculate the water. The water should always flow toward the house so wealth flows to you and not away from you. Water flow equals income luck, meaning what you earn as opposed to wealth luck (accumulated water). 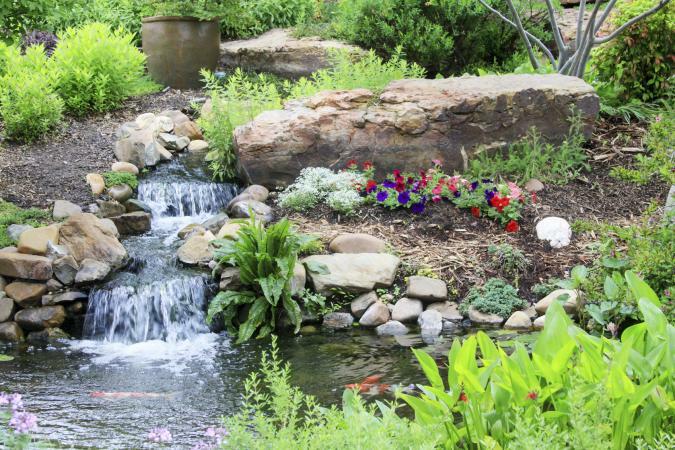 Build a stream - If you're going to build a stream through your garden to fall into your pond, then it should meander toward the pond, not follow a straight path. The meandering, curving stream is considered auspicious, whereas a rigid straight flowing stream is inauspicious. Flowing water should always flow toward your home. Despite some water flow going the wrong way, this video below can give you plenty of ideas that can be used for your pond; just remember to flip the direction of water flow as needed. Once you've built your pond, it's time to landscape. 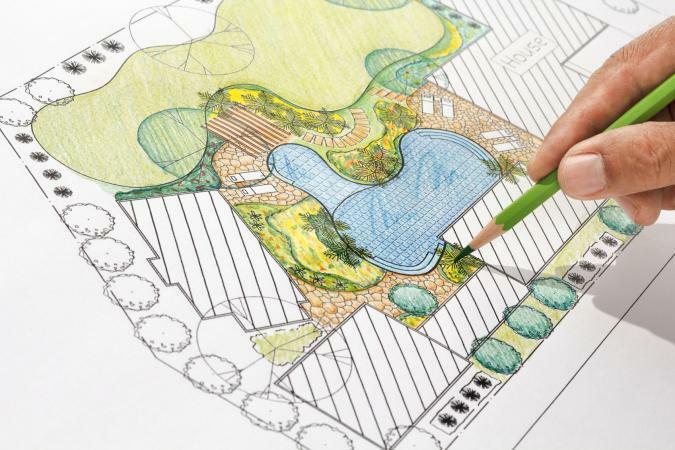 You can use some of the basics of feng shui garden design in making your selections. You'll want a mix of aquatic plants and different types of elements. Add several sizes of rocks and boulders. Rocks are used throughout Chinese gardens and ponds since they represent auspicious mountains. You want the landscape to appear natural so select rocks specific to your region. When most people think of a koi pond, the image of lily pads and lotus blooms is their first thought. These and other aquatic plants are vital to pond health for the koi. Choose other plants that will aid in the natural filtering of water. Water lettuce is floating rosette foliage that looks like lettuce. Hakuro Nishiki willow, or tri-colored colored willow, has white and green leaves with tiny pink blooms. Big blue lily turf plant is a semi-evergreen, grass-like ground cover with spike flowers. The clumps are variegated turning a bronze-green during winter. While traditional Chinese gardens don't contain flowers, relying mostly on green plants and blooming trees, you certainly can design your koi pond to feature colorful plants. Blue lilies and blue/purple irises are yin choices. Red begonias and yellow daisies are yang colors. Small trees, such as Japanese maples and different varieties of junipers, are just some types of plant life you may wish to include in your design. Depending on the size and shape of your pond, you may have space to feature a small classic arched footbridge to span a section of the pond that leads to a garden path or patio area. Traditionally, the semi-circle arch was designed so it was reflected in the water to give the illusion of a full circle that represented heaven. The feng shui magic of a koi pond is both aesthetic and wealth generating. The koi fish generate yang energy while the reflecting water doubles wealth with the illusion there are two of everything, such as the plants, footbridge, house, and everything surrounding it.